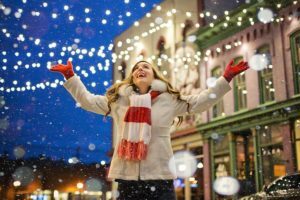 The kids are still home from school, so why not try out some of our local holiday wonders – ones you may have missed while getting ready for the big day yesterday. If you’re into ice cold water to remind you it’s a new year, this one’s for you. This week and early next is the best time to go to Seattle, before Viadoom takes over when the Viaduct closes and traffic is predicted to be catastrophic. Enchant: New this year, Enchant Christmas is an immersive holiday experience with lights, a market, ice skating, entertainment, food and drink and more at Safeco Field. I’ve heard they have “pay what you can” days, but I don’t find that on their website, so you’ll need to ask. 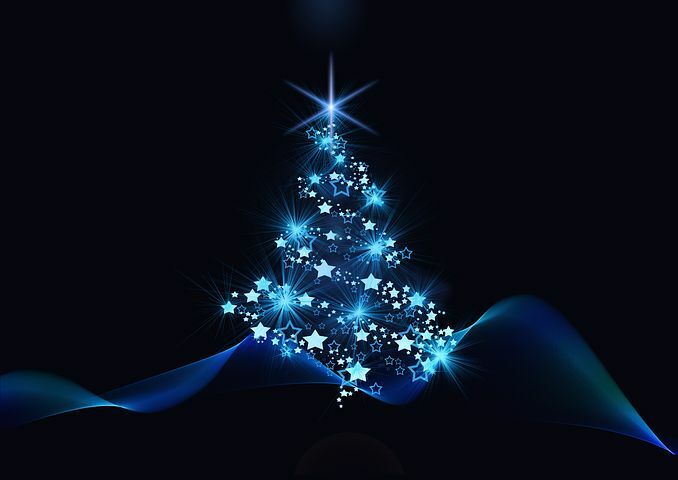 This event runs through December 30. Seattle Center Winterfest, Through December 31, the Seattle Center is filled with free and affordable activities such ice sculpting and ice skating. The festival rings in the New Year with spectacular fireworks, Fountain of Light dance party and live music by premier cover band, Sway. Nutcracker Ballet Just two more days to see the Pacific Northwest Ballet’s rendition of the Nutcracker at McCaw Hall. But that means they have some screamin’ good deals. Enjoy the wonder of oversized gingerbread house made with more than 4,000 real gingerbread bricks. This is one of my all-time favorite charity events. Stop by and see what local architects can create from gingerbread. Open until January 1 in the lower lobby of the Fairmont Olympic Hotel. If you’re ready for a short road trip, here are my suggestions for activities beyond Seattle and Tacoma. New Year’s Eve Wildlife Viewing Cruise with the Port Townsend Marine Science Center: Leaving from Port Townsend’s Point Hudson Marina at 1 p.m., tickets cost $55 per person. Call 360.385.5582, ext. 104, to make reservations. First Night Celebration in Port Townsend: This all-ages, alcohol-fee event features live music and children’s activities. From 6 p.m.-9 p.m.
New Year’s Eve at Taps at the Guardhouse at Fort Worden: 8 p.m. -midnight. Live music and bubbly. Let’s not forget our friends to the east. Bellevue goes all out with their fun and frolic for the holidays. Garden d’Lightsat Bellevue Botanical Gardens runs through December 30. I saw this last year for the first time and was blown away by the amount of work that goes into this more-than-magnificent lighting display. Children under 10 are free, everyone else pays just $5. This entry was posted in Beaches, Fairs and Festivals, Family Fun, Free, Gardens, hotels, Seasonal, Seattle, Towns, Zoos and Wildlife and tagged Christmas, lights, New Year's Eve, Nutcracker Ballet, polar bear plunge, road trip, Viadoom on December 26, 2018 by Heather Larson. There used to be a single date in July where you were guaranteed a rain-free day and could schedule an outdoor wedding. That’s it. One day in the Pacific Northwest. Now we’re experiencing warmer temperatures more often. I’d still check the weather forecast too see if you need any rain clothes before heading out in July. But our rain, this time of year, is usually just a drizzle, so don’t let talk of precipitation dampen your plans. July 3-10: Port Townsend’s Festival of American Fiddle Tunes attracts fiddlers, fiddle lovers and dancers to Fort Worden State Park. July 4: Tacoma’s Freedom Fair , located on the Ruston Way waterfront, has a little of everything – an air show, food, exhibits, rides while getting the breeze off the bay. July 4: Seattle’s Seafair Summer Fourth means grandiose fireworks at Gas Works Park. July 4: Grand Old 4th Parade and Celebration in Tri Cities lets you begin the day with a pancake breakfast, followed by a fun run, parade and of course, a dazzling display of fireworks. July 8-9: Redmond Derby Days includes a parade, musical entertainment and a beer and wine garden. 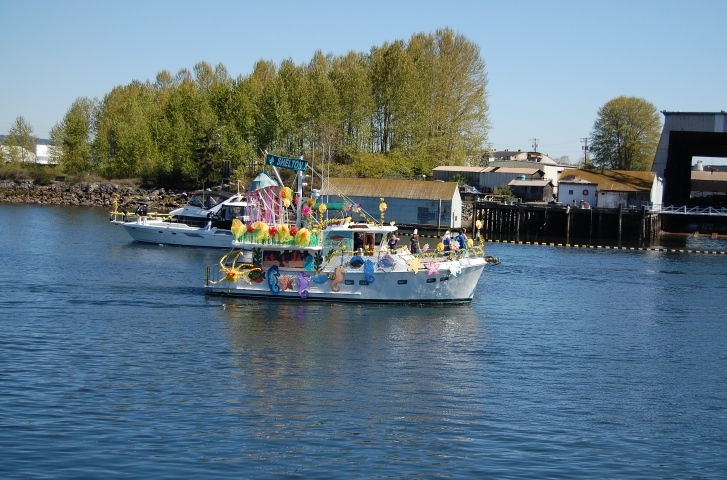 July 8-10: Kent Cornucopia Days has everything you could possibly want in a hometown festival from food to booths (400 vendors) to carnival rides and dragon boat races. Another one of my personal favorites. July 9-10: Seattle’s Ballard Seafood Fest has been an event since 1974 designed to celebrate Ballard’s connection to the fishing industry. Try an adult beverage to go with your seafood choice, listen to live music, shop for arts and crafts and more. July 14-17: King County Fair in Enumclaw promises a truck pull, pig races, mutton bustin’, amusement rides, flying dogs and a bungee trampoline. July 15-17: The Bite of Seattle showcases more than 60 area eateries, has beer and cider tasting, a wine bar and live cooking demonstrations. July 15-17: The Vashon Island Strawberry Festival may not have as many fresh strawberries as usual because the crop was early this year. The festivities won’t be dashed though, you’ll find plenty of action including a classic care parade and a street dance. July 15-17: Sequim Lavender Weekend celebrates the fragrant herb with farm tours, musical entertainment and a street fair. I have it on good authority that this year you’ll find more activities than ever before. Don’t be surprised if you see shades of purple everywhere. July 20-23: Long Beach hosts a sandcastle building completion called Sandsations on the shores of their peninsula. July 29-31: Bellevue BAM Artsfair closes some of the downtown streets so artists and crafters can display and sell what they’ve made. This fair never disappoints. July 30: Seattle’s Torchlight Parade in conjunction with the Seafair celebration. I believe this Olympic Peninsula Culinary site is new or at least updated. If you’re visiting the Peninsula, keep it handy. Want to learn more about whales? After all, sharks have an entire week on TV. Let’s give whales equal time and follow the Whale Trail. 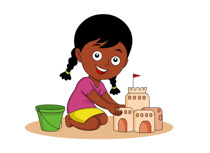 If you want to learn to make sturdy sand sculptures, check this out. All summer long, two-hour sand-sculpting lessons will be available for a fee to small groups of up to 10 people on Wednesdays through Sundays, in Long Beach. Wash. People will gain hands-on experience from concept and technique through build and sculpting. Sign up here. What is your favorite July activity? This entry was posted in Art, Beaches, Calendar, Fairs and Festivals, Family Fun, Free, Seasonal, Seattle, Towns, Uncategorized and tagged 4th of July, art, Bellevue, cider, Fiddle, Kent, Lavender, Long Beach, Mead, Orcas Island, Port Townsend, Redmond, sand sculpture, Seafair, Seattle, Sequim, strawberries, Torchlight Parade, Tri-Cities, Vashon Island on June 29, 2016 by Heather Larson. I can’t even fathom how long a comprehensive list of every event taking place in Washington might be. It would probably break the Internet. So what I’m posting is can’t-miss festivals, new activities and darn it, my personal favorites. June 2: Alderbook Resort & Spa, where the spa happens to have doggy massages on the menu, presents the “Spirit of the Canal” Distillers Dinner. Make reservations through Edible Seattle or the resort which has discounted overnight specials for this occasion. June 4: Oddmall Emporium of the World, Everett. If anyone goes to this, please let me know what happens there. I’m intrigued. June 4: The town of Lynden will try to break the Guinness Book of World Records by making the world’s longest strawberry shortcake. This is where I’ll be. 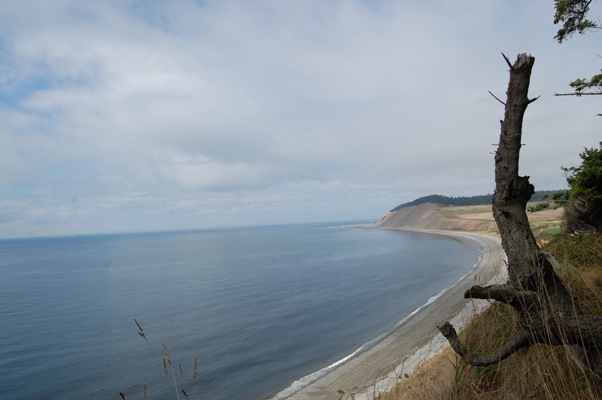 June 4: National Trails Day means free State Park admission in Washington on this Saturday. Should you want to combine visiting a state park with hiking, may I suggest looking at the Washington Trails Association site or check in with one of the most prolific hikers around, Craig Romano. June 10-12: Craft Wine Fest featuring beer as well in Vancouver, USA. June 10-12: Maple Valley Days, Maple Valley. My old stompin’ grounds so I’m partial to this town’s celebration. June 11: Cama Beach State Park on Camano Island is hosting a fishing derby for kids 16 and under. No license is required and because this is also National Get Outdoors Day, once again you don’t need a Discover Pass because all state parks offer free entry that day. June 18-19: Walla Walla Onion Festival. I wrote about this and several other Northwest festivals in the May/June issue of Northwest Travel & Life Magazine. June 24-26: Taste of Tacoma. My hometown and where I first tasted alligator on a stick. Travel Tacoma recently unveiled their spiffy new website where you can look for other attractions to visit. June 25-26: Spokane’s Hoopfest, one of the biggest 3-on-3 basketball competitions in the nation. For lodging, restaurants and other activities in Spokane, look at their tourism site. You can now take a tour with a park ranger at Point Defiance Park in Tacoma. Don’t mess with Mary Krauszer because she’s also a jammer for the Dockyard Derby Dames. The San Juan Islands recently introduced an app, San Juan Islands Insider, that gives you tips on where to explore, how to gather points and then trade those points in for goods and services on the islands. Available on either Google Play or at the App Store. 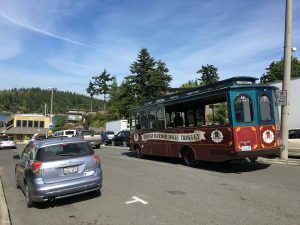 See Friday Harbor on the Jolly Trolley instead of hoofing it everywhere. By taking a riding tour, you can better scope out where you want to spend more time. As if Lakedale in Friday Harbor, doesn’t have enough different types of accommodations, this year they installed new canvas cottages. Did I forget anything you absolutely love? If so, please let me know and I’ll add it. This entry was posted in Beaches, Calendar, Dog-friendly, Fairs and Festivals, Family Fun, Free, Hotels and Other Lodging, Seasonal, Tours, Towns and tagged Alderbrook Resort & Spa, Cama Beach State Park, Camano Island, Craig Romano, Distillers Dinner, Edible Seattle, Edmonds Waterfront Festival, Everett, free, Friday Harbor, hiking, Jolly Trolley, June 2016, Lakedale Resort, Lynden, Mapple Valley Days, Mary Krauszer, Marysville Strawberry Festival, National Trails Day, Northwest Travel & Life Magazine, Oddmall Emporium of the World, Point Defiance Park, Ranger, San Juan Islands, Spokane's Hoopfest, State Park, Tacoma, Taste of Tacoma, Vancouver USA, Walla Walla Onion Festival, Washington Trails Association, wine on May 31, 2016 by Heather Larson. When I bought tickets for “Outlaw Days,” I wasn’t sure what it was. But the tickets were only $5 each and I’d heard so much about the Mary Olson Farm in Auburn and the activities there, I thought I couldn’t miss. Although “Outlaw Days” aren’t on the Farm’s calendar this summer, plenty of other activities are. Every Saturday and Sunday, from noon ’til 5 p.m., June 25-August 28, you can tour the farmhouse, meet up-close-and personal with the cows, chickens and donkeys and even bring your picnic basket full of goodies to eat on the grounds. That’s all free. Also, at no cost, let the kiddos, ages 3-12, participate in a themed activity hour any Wednesday in July at 10:30 a.m. But the piece de resistance must be the overnight stay, July 15 and 16, for those 7-12 years of age. Visit Overnight for details and to register. The Farm holds numerous events throughout the summer including summer camps for kids, group tours, concerts and special events like “Outlaw Days.” A project of the White River Valley Museum, the Farm originally operated as a subsistence farm. In 2011 it was restored to its current state and opened to the general public. 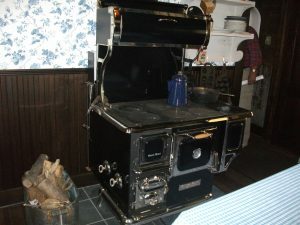 The interior of the house is furnished just like an old farm house. This entry was posted in Fairs and Festivals, Family Fun, Free, Museums, Seasonal, Tours and tagged Auburn, camp, cows, donkeys, kids, Mary Olson Farm, museum, overnight, tours, White River Valley Museum on May 30, 2016 by Heather Larson. Are You Half of the “Missing” Couple? Eighteen sponsors have banded together so that one lucky bride and groom can say their wedding vows on beautiful Whidbey Island in Washington State for free. Some of the details have been prearranged. 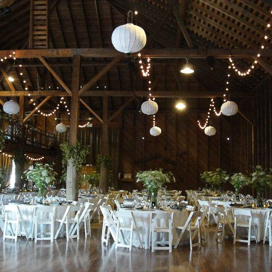 The wedding will take place on Saturday, January 17, 2015. The invitations, a venue that accommodates 48 guests, a cake, flowers, a photographer and a musician are all set and ready to make your day a memorable one. 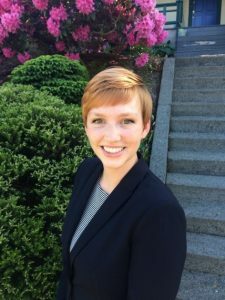 Gloria Mickunas, a professional wedding planner, promises to work with you on the rest of the elements you want. This prize has a value of more than $15,000. Would you like to get married on this picturesque island just 25 miles north of Seattle and 70 miles from the Canadian border? If so, you can nominate yourself by writing what this wedding would mean to you and your significant other and submitting a photo of the two of you before the entry deadline of October 31, 2014 at midnight Pacific Daylight Time. Then get your friends and family to vote for you, maybe even the grocery clerk. The public’s votes will narrow the contestants to 10. Then one lucky couple or the “discovered” couple will be selected in a random drawing. Voters won’t be left out either. 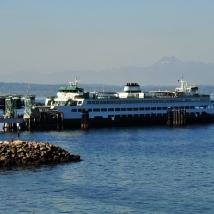 They have a chance to win a two-night getaway on Whidbey Island in a random drawing. To find out more about winning a fairy tale wedding in a dreamy destination, visit WinAWhidbeyWedding. Please come forward if you’re part of the “missing” couple. This entry was posted in Beaches, Free, Seasonal and tagged contest, Gloria Mickunas, Missing couple, wedding planner, Whidbey Island on September 14, 2014 by Heather Larson. Every spring Tacoma and Pierce County pay tribute to the buttery yellow flower. This year (2018) as always, look for a parade in four cities all on April 7. 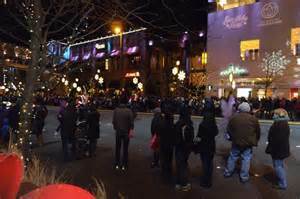 Crowds turn out and line the sidewalks, first in Tacoma, then Puyallup, Sumner and finally in Orting to view floats, bands, princesses and more. Thousands of fresh-cut daffodils will adorn the floats. As sometimes happens in the Pacific Northwest, it might rain. 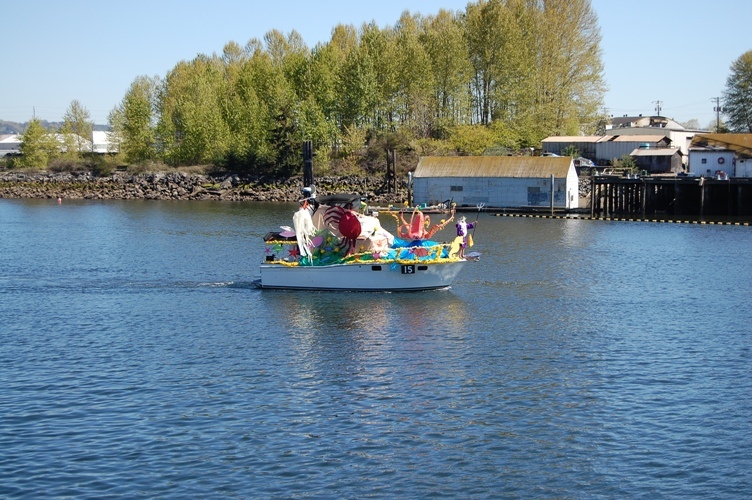 On Sunday, April 15, Tacoma celebrates boats and our waterways with a Marine Parade. 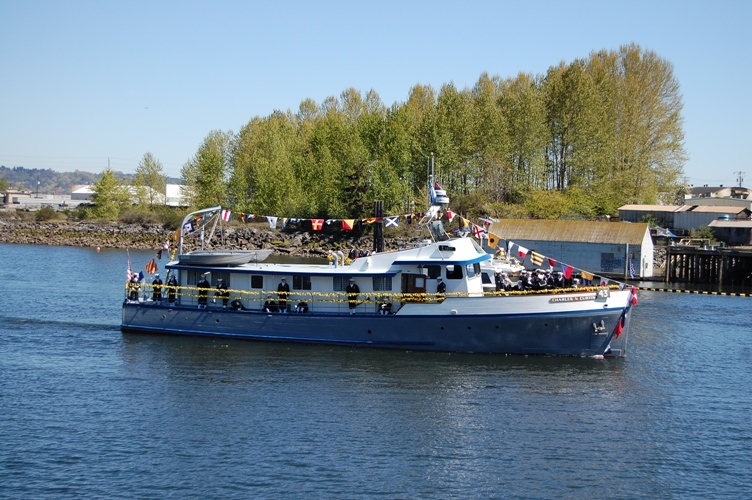 More than 40 boats will cruise from the Tacoma Yacht Club to the Thea Foss Waterway. Those are authentic mermaids on the front of the boat. If the sun makes an appearance, you’ll be able to see the Olympic Mountains and Mt. Rainier. People’s Choice Winner – the pink octopus revolves and they played the Beatle’s song about an octupus garden on the boat. This entry was posted in Fairs and Festivals, Family Fun, Free, Seasonal and tagged daffodils, marine parade, Mt. 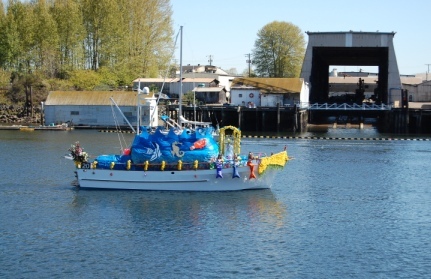 Rainier, Pierce County Annual Daffodil Festival, Tacoma, Tacoma Yacht Club, Thea Foss Waterway on April 14, 2014 by admin. 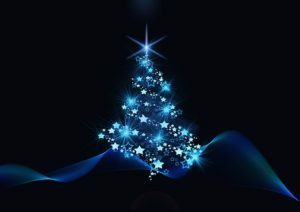 All the gifts have been unwrapped, the tree is starting to shed and too much fattening food calls to us from the kitchen. It’s time to get out and enjoy some holiday offerings in the Pacific Northwest. Here’s a list to get you started. Stroll down Celebration Lane at The Bellevue Collection, where live toy soldiers rove streets, music fills the air and a dazzling light show illuminates the lane, until December 31. While in Bellevue, explore Bellevue Botanical Garden’s Garden d’Lights, a nationally recognized holiday display with more than half a million lights illuminating a winter wonderland, until January 4. For an educational experience outside the school setting, an 1860s sewing machine is featured at a new Fort Nisqually exhibit highlighting its revolutionary impact on the daily lives of women in those times. “Turning Drudgery into a Pastime” is on display through April 5, 2014 and is included in the price of admission to the fort. For more information, call (253) 591-5339 or go online to FortNisqually.org. Fort Nisqually Living History Museum is a restoration of the Hudson’s Bay Company outpost on Puget Sound located in Point Defiance Park, Tacoma. Visitors experience life in Washington Territory during the Fur Trade era of the 1850s. Nine buildings are open to the public, including the Granary and the Factors House, both National Historic Landmarks, and a Visitor Center with Museum Store. 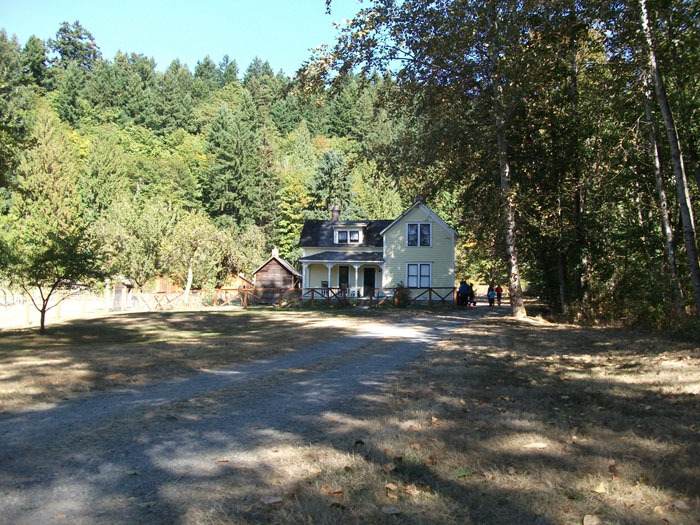 Fort Nisqually Living History Museum is a facility of Metro Parks Tacoma. How About Some Snow Play? Squeals and laughter fill the air as people of all ages have a blast on snow trails. Join a park ranger to learn the art of snowshoeing and discover how plants, animals, and people adapt to the challenging winter conditions at Mount Rainier. When: Update 12/20/13. First-come, first-served guided snowshoe walks will begin on December 24, 2013. Snow conditions permitting, the walks are generally offered on Saturdays, Sundays, holidays, and daily during winter break from December 24 to January 1. After early January, walks are only offered on Saturdays and Sundays, and holidays. Walks start at 11:15 a.m. and 1:45 p.m. and meet inside the Jackson Visitor Center (near the information desk) in Paradise. Sign-ups begin 1 hour in advance of scheduled time. Distance & Time: Snowshoe walks cover approximately 1.5 miles in 2 hours. Group size: Snowshoe walks are limited to 25 people, eight years old or older, on a first-come, first-served basis. A sign-up sheet is available at the Jackson Visitor Center information desk one hour before each walk. All snowshoe walk participants must be present at sign-up. Skiers, riders and foot passengers can all take a ride to the Crystal Mountain summit for captivating mountain views, a delectable meal at the Summit House and a great run down the slopes. Dogs allowed on the gondola, but not in the Summit House. Don’t want to venture out just yet, then download the free interactive eCookbook from Visit Seattle, that highlights a range of talented chefs and signature Pacific Northwest cuisine. Fresh From Seattle features 26 recipes from 12 noteworthy local chefs, including acclaimed hotel chefs and award winners such as Tom Douglas, Maria Hines and Thierry Rautureau. For more family fun check with my two favorite sites: Rubyslipperguide.com for the Eastside and SoundsFunMom.com for the South Sound. This entry was posted in Dog-friendly, Family Fun, Free, Seasonal, Uncategorized and tagged activities, Bellevue Botanical Gardens, Bellevue Collection, Celebration Lane, Crystal Mountain, Fort Nisqually, Fresh From Seattle, holiday, Maria Hines, Mount Rainier, Rubyslipperguide.com, snow, snowshoe, SoundsFunMom.com, Summit House, Thierry Rautureau, Tom Douglas, walks on December 27, 2013 by admin. 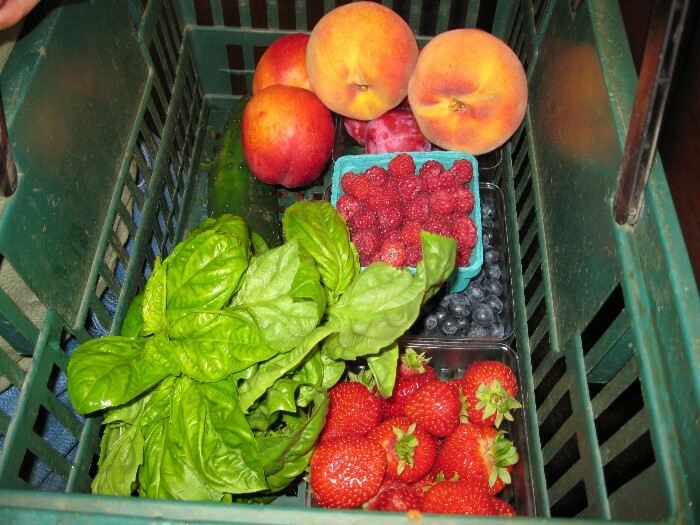 Farms runs from 10 a.m.-4p.m. each day with opportunities to visit educational exhibits, take farm tours, view gardening demonstrations, taste mouth-watering samples, let your kids try farm activities and everyone can navigate corn mazes. Here’s a brief preview of what you’ll discover on this tour. 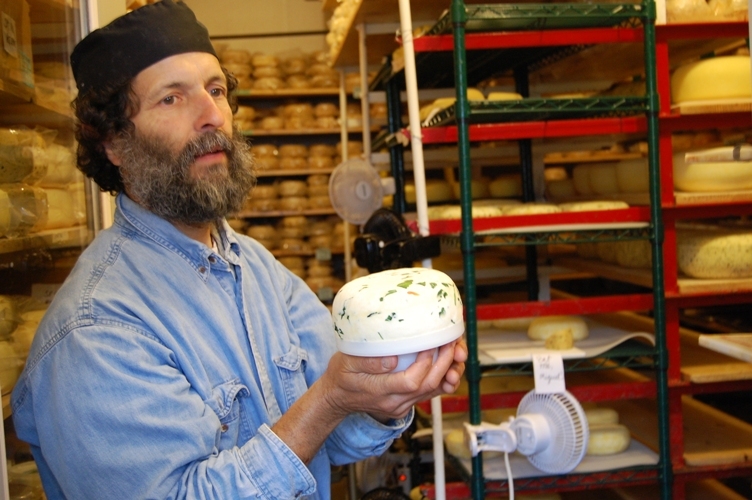 Stop by Samish Bay Cheese in Bow and taste the phenomenal Arugula Ladysmith cheese that Roger makes. produce and honey from Belleville Honey Company. children try the scavenger hunt and before you leave, shop for bulbs and gardening tools. Wineries, dairies, cattle ranches, produce farms and more complete the tour. There’s so much to see you might want to spend the weekend. bounty and eat it freshly cooked or store it in a full-size refrigerator. This entry was posted in Fairs and Festivals, Family Fun, Free, Gardens, Hotels and Other Lodging, Seasonal, Tours and tagged Burlington, Candlewood Suites, cattle ranches, Chuckanut Drive, dairies, Mount Vernon, RoozenGaarde, Sakuma Bros. Farms, Skagir Valley Festival of Farms, Skagit Valley, Taylor Shellfish, wineries on September 23, 2013 by admin. At the beginning of March, two other travel writers, a VisitRainier employee and I experienced the feeding of the elk at Oak Creek Feeding Station, off Highway 12 near Naches in Eastern Washington (yes, it was a press trip). We got close enough to these four-legged giants to make eye contact. This supplemental feeding program, began in 1945. It was adopted so that the elk wouldn’t venture into any of the agricultural areas nearby looking for food in the winter. Depending on the weather, feedings begin sometime in December and continue until March. If you visit in January or February, you’ll have the best chance of participating. Everything is free – you just have to sign up and put your John Henry on a disclaimer. 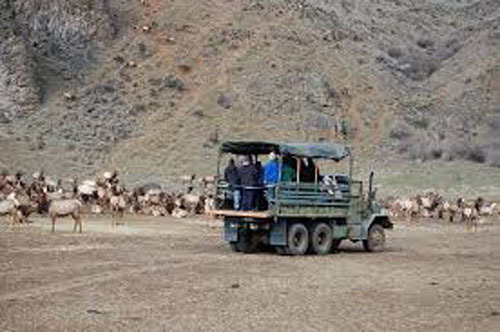 Then you can ride out into the field in a U.S. Army truck and witness the feeding of as many as 700 elk at a time. While you patiently wait your driver dispenses facts and figures about the program and cows and bulls snuffle and shift positions anticipating the upcoming buffet of hay. Then two other vehicles roll out and automatically start dispensing the bales while the regal animals jockey for position. A bull can weigh up to 600 pounds, but they have no interest in the humans staring at them. They only want the food so you’re safe. I have never witnessed anything like this and highly recommend it as a family outing. Arrive before 1 p.m. to check in, visit the small museum and watch the elk head down the hill for lunch. 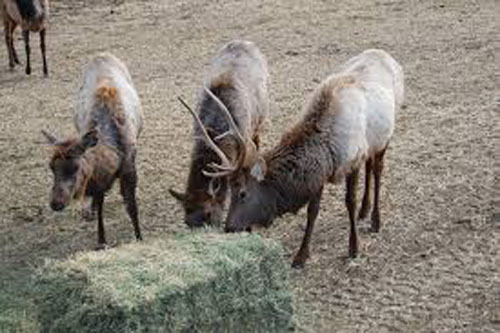 This entry was posted in Family Fun, Free, Seasonal, Tours, Zoos and Wildlife and tagged Carrie Uffindall, elk, feeding program, Highway 12 Naches, Naches, Oak Creek Feeding Station, VisitRainier on April 1, 2013 by admin. This should fall under the heading, “Did you know?” Every year on the first weekend of March, at the summit of White Pass a Winter Carnival beckons snow lovers. I just experienced the 27th annual carnival and found the wealth of activities a delight. White Pass is located on US Highway 12 on the White Pass Scenic Byway. Many Washingtonians haven’t even visited this ski area and are surprised learn about what goes on there. 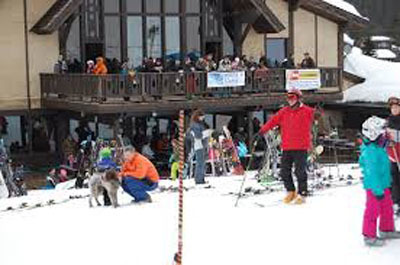 It offers 1,500 acres of Alpine terrain, Nordic trails and lodging. Snow enthusiasts can downhill and cross country ski, snowboard and snowshoe. The lodge handles equipment rental, has child care, serves food and beverages and houses a well-stocked pro shop. But back to the carnival. 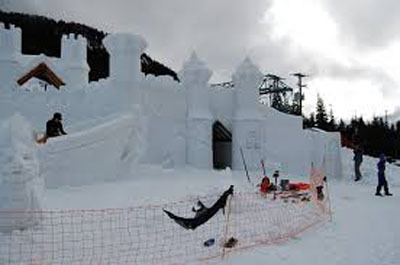 Several volunteers, many who work in the construction business, build a snow castle that becomes the showcase sculpture for the event. More than 15 people helped to create the castle this year. It is made with forms packed with snow. Each element of the structure contains a number of forms, so it’s a slow process, but it’s done that way to make it safe. Throngs of folks walk through the castle at the event, something the kids especially treasure. A safe, snow structure is subject to a most unpredictable Mother Nature. “It’s crucial that it stays cold for the castle. Rain and wind beat it up,” said David Ruby, a Packwood resident and lead volunteer. The normal time frame to complete the castle is two weeks; that’s without any unexpected weather fronts. Touring the castle and using the slide inside is free for everyone. Other activities may involve a fee. During daylight hours on Saturday and Sunday, skiers and boarders race, take lessons or just tackle some runs for fun. On Saturday evening, a dinner of prime rib or spaghetti is available for purchase. As the night draws to a close, the entire ski patrol carries torches and crisscrosses on skis down the main hill. That signals the beginning of the fireworks show and the end of the evening. Sunday sees more of the same. I urge you to mark your calendars for the first weekend in March, 2014, so you too can take part in the festivities at White Pass. Or visit anytime to play in the snow. For other winter activities available now, look at Visit Rainier. This entry was posted in Art, Dog-friendly, Fairs and Festivals, Family Fun, Free, Seasonal and tagged Alpine terrain, castle, David Ruby, lodging, March 2014, Nordic trails, Packwood, skiing, snowboarding, snowshoeing, US Highway 12, White Pass, White Pass Scenic Byway, White Pass Winter Carnival on March 4, 2013 by admin.